The prevalence of local adaptation is a hotly debated topic among evolutionary biologist. Meta-analyses of reciprocal transplant experiment indicate that local adaptation is present in ~70% of published comparisons. However, the prevalence of maladaptation is likely rising as populations are increasingly confronting novel or unusual conditions as climatic change alters both the average values and year-to-year variances of many environmental parameters. A key signature for documenting climate-mediated patterns of maladaptation is adaptation lag. When the climate changes as fast or faster than the rate at which adaptive evolution proceeds within a population, a pattern emerges where local populations have lower average fitness in their native habitats than populations from sites in which historical conditions better match the contemporary environment. Our group has recently documented an adaptation lag in Mimulus guttatus such that elevation matched populations from the Sierra Nevada in California have higher fitness in Oregon Cascades than local Cascades populations in recent years with early growth seasons. 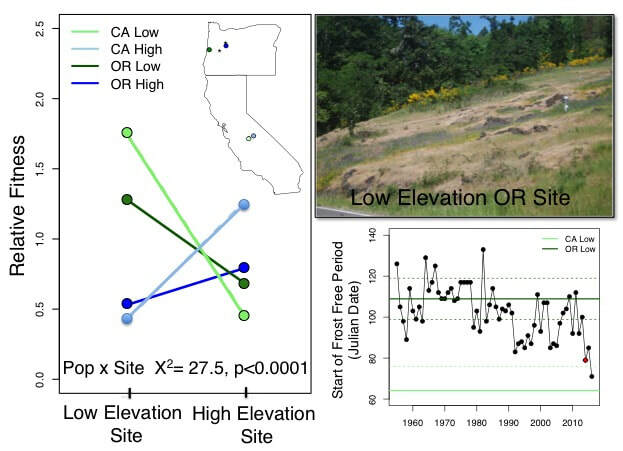 Results from phenotypic selection experiments in field populations suggest that California populations more optimally time transitions to flowering in both low and high elevation populations. We continue to examine how fluctuating selection between years impacts signatures of adaptation and how genetic correlations between traits (particularly developmental timing and defense) may constrain evolutionary rescue. Figure (left): Results from common garden experiments conducted in 2014 in low and high elevation population in central Oregon. Growth season start dates more closely match historical California averages than historical Oregon averages and elevation-matched California populations have higher relative fitness than Oregon populations.